Originally hailing from the suburbs of Chicago, big wave surf photographer - Paige Laverty now calls the undulating streets and waves of San Francisco her home. Ocean Beach, to be precise, is where she has settled her salty lens...for now anyway. The adventure content creation community. But, where did it all begin for the girl that now heads out at Mavericks on the big days to shoot some of the world’s bravest surf souls? Paige describes herself in her earliest years as a relatively ‘unfiltered’ little girl, always first out of the car at the playground ready to make friends with new faces, big and small. I’ve always been interested and dabbled in it. In October last year, I decided to really get after it and bought myself a camera, some lenses and housing to take photos from the water. Mixing photography with surf and travel is my formula for pure happiness. It’s the focus of every day. When did you catch your first wave, and how did it feel? I took my first surf lesson as soon as I moved to California at the end of 2011. I drove my Vespa across the Golden Gate Bridge and along the winding road to Stinson Beach. I paddled out and loved everything about it. Being in the ocean, the backdrop of the hills, the marine life…my surf instructor! I stood up for a second or so and fell hopelessly in love with it. It feels like freedom. What is it about the ocean that draws you back? It’s where I am meant to be. I feel thankful and peaceful when I’m in or even just near the ocean. I get an overwhelming feeling of love and gratitude, that’s how I know I’m on the right path. 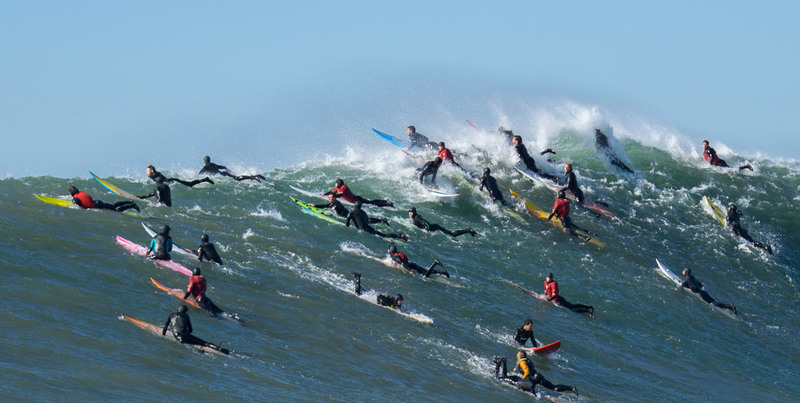 On a big day at Ocean Beach, it’s a mixture of joy and sheer terror. But I’ll always come back for more. Most people don’t live ‘out of control’ moments anymore. Surfers and in-water surf photographers do. Maybe that’s part of its draw. 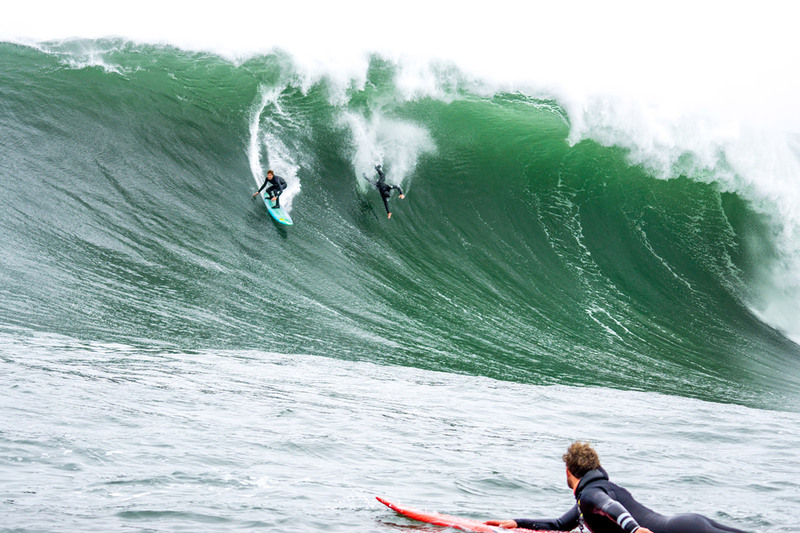 How did you get to shoot mavericks and what was it like? I’ve been out a few times on epic days. My first time was December 7th 2015. It was insanely big. The boat I was scheduled to go out on cancelled because it was too dangerous to even get out of the harbour. A bunch of us girl surfers talked our way onto a smaller boat and got front row seats to sets as big as 50 feet. It was just us, the rescue team and a couple of surfers. I managed to sell a few photos to Surfer Magazine that day, and it for sure goes down as one of the best days of my life. 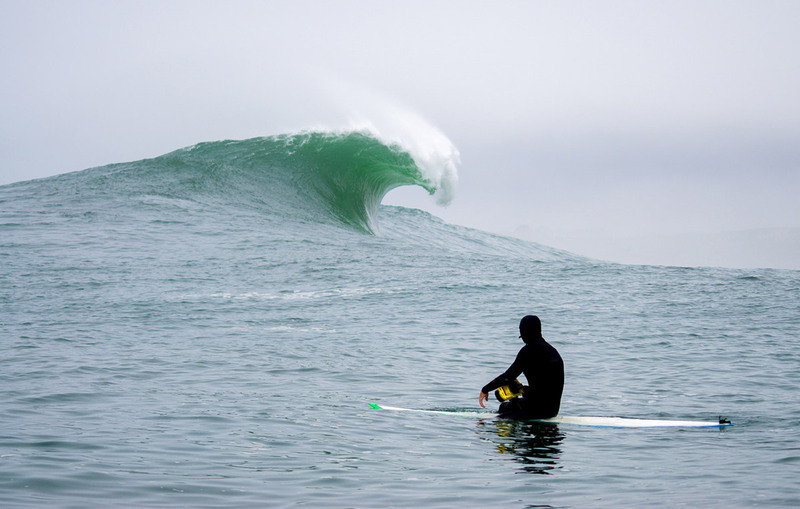 How would you describe the big wave community? It’s a very close-knit community. On the right swells, people come in from all over the world. Even if not everyone knows each other, there’s a real feeling of connection out there. Maybe it’s because your life is literally on the line, the surfers look out for each other. There’s a lot of respect. The guys that head out at Mavericks use the boats to store food, drinks and extra boards so they’re always coming to the boats between waves for a rest and a chat. It’s a great feeling, you can talk to anyone because everyone is out there for the same reason, we all love it. Even shooting from the boat you feel like you’re part of it. The best bit for me is sharing photos with the surfers, because they’re always so stoked to get them. And it’s a pretty awesome feeling for me too, especially when Jamie Mitchell is emailing you to see what you got! Who have you enjoyed shooting the most? I got lucky enough to swim out at Ocean Beach in my home town of San Francisco and randomly shoot Kolohe Andino. That was rad. But I think my favourite thing is swimming out on a big day and just capturing the locals. I try to stay at the good peaks, but I’m always super stoked to shoot anyone who comes within range. I always feel this sense of pride that I live here and am surrounded with fearless, talented rippers. It’s pure love for the place, and it’s on everyone’s big smiling faces. What do you do with your shots? Since I’m still trying to hone my skills at the moment, I’ve decided to give my photos to surfers in exchange for a small donation to the Syrian family I’m trying to raise money for. They’re refugees in Lebanon and all need medical attention but can’t afford it. It’s an amazing cause, because it’s so direct. 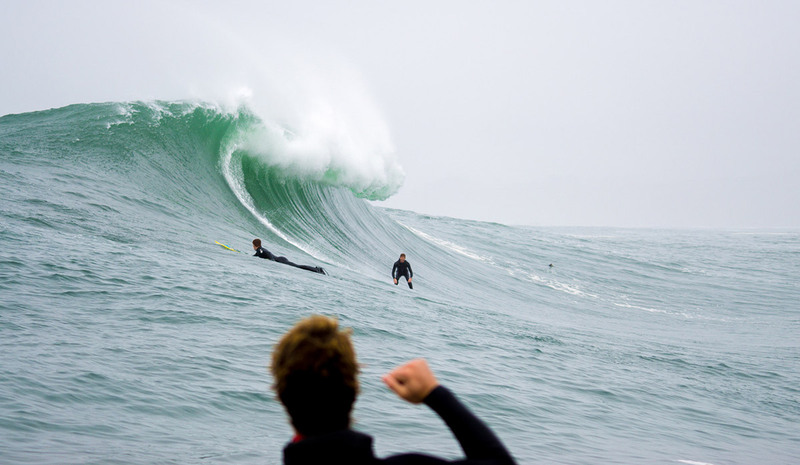 What’s your scariest experience in a wave? I had a scary re-entry into the harbour after a day at Mavericks. Everything on the boat got tossed around and broken. I think the scariest thing though is when I take photos in the water. I swim out with fins and a camera when sets are as big as 15 feet. It’s a punishing, heavy wave and it can be chaos out there. The scariest moments are when a huge wave breaks 20 feet in front of you, then you know you’re screwed. But that terror soon turns to calm because you know there’s nothing you can do except whisper a few swear words and hold your camera like a football to your stomach. The wave is going to do whatever it wants to do with you, so it’s a case of curling up tight into a little ball, plugging your nose and protecting your head. I’ve hit the bottom, been held under and had my limbs yanked about. Most people don’t live ‘out of control’ moments anymore. Surfers and in-water surf photographers do. Maybe that’s part of its draw. I definitely want a surf photography trip. I’m feeling real antsy right now and the winter and waves are coming to an end. I’m lucky enough to not be tied down to a job so I have the luxury of going anywhere, last minute. I’m not a big planner though, I’m thinking a warm water spot. Do you think you’ll be living the same lifestyle in 20 years time? Hopefully I’ll be shooting surf for work and travelling a lot. That’s the goal. I’m 100% sure I’ll be surfing and taking photos. Be the first in line and the last to call it quits. It’s a line from the top of a Roxy ad that I ripped out and put on my fridge. I’m pretty stubborn by nature, so it called to me.